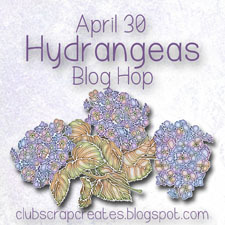 Welcome to my stop on Club Scrap's Hydrangeas blog hop! I'm so happy you are here. If you arrived from Tiare's blog, Tiare Smith's Designs, you are on the right track. For the entire list of participants, hop back to our starting point, Club Scrap Creates. Earlier this month, I was honored to be the Guest Artist for the Hydrangeas Greetings to Go pack. You can check out all my cards here. The element of the G2G pack that caught me off-guard was the 5-pack of paper doilies. 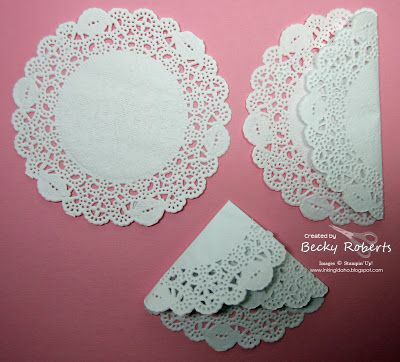 I've used doilies to line cake plates, even as stencils to dust powdered sugar on top of desserts, but I've never used them on greeting cards. For inspiration, I turned to the place that holds a wealth of creative ideas--Pinterest. I even created a board focusing on greeting cards that feature paper doilies. Check it out to find ideas on how to use your paper doilies! There were some wonderful comments made about my greeting cards (thank you!! ), but most of them mentioned the doily dress I made on this card. Want to create this dress yourself? I found the instructions on this site: Inking Idaho. Becky is a successful Stampin' Up! demonstrator with a host of amazing and creative ideas! She shares this pictorial on how to fold the paper doily into a layered skirt. Easy!! For the bodice, I embossed a piece of white Club Scrap cardstock with a swirl embossing folder, then sketched the shape onto the back--no pencil lines to erase after cutting out the shape. You can see various types of bodices on my Pinterest paper doily board. The ribbon hides the junction and adds a pop of color. The next time I make a doily dress, I'm going to first color the doily like I did on this card. It was incredibly easy! 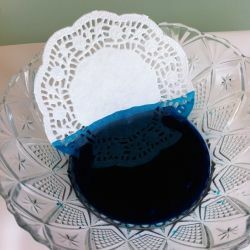 I've seen instructions on how to color doilies by dipping them in a bowl of water colored with food coloring. Seriously??! How messy!! Just look at all the supplies needed on this blog. She even includes rubber gloves and a "sense of adventure"--come on, I just want to color a paper doily! So, what does the seasoned paper crafter use for this otherwise daunting task? A few sprays of Stewart Superior's Memories Mist does a fabulous job. If you want to see the many colors they offer, check out this page--go half way down to the Mists section. I just laid the doily in a CS pizza box and spritzed the Memories Mist enough to cover the doily. It didn't take long to dry and become a part of my "Thinking of you" card. Yes, doily dresses in a variety of colors will be in my future! Thanks for stopping by. The next stop on our hop is Marya's blog: A Notebook Novel. I know you will be amazed at her creativity--I always am! Absolutely lovely cards and beautifully done with the doilies. Must try this soon. So glad you showed your technique! Easy peasy! Lots of dances coming up, this would be a fun embellishment for projects I have in mind. Thanks for the inspiration! Very pretty card - I love the little dress just darling. Too funny on using the food coloring...I agree - it's not rocket science ;) TFS your inspiration! Off to buy some food coloring. NOT! Thanks for sharing the details on this clever little doily dress! Lisa, your paper doily dress is just the sweetest and your cards were amazing. I loved all of your cards Lisa, but the clever use of doilies were wonderful to see. Who knew there were so many uses for these in the craft world. Thanks for the inspiration! All your cards were amazing! The doily dress was my favorite by far. Very creative! Thanks for the doily tutorials and the link to your Pinterest boards. So much inspiration! Yep, you make a doily as cute as it possibly can be! I loved your rendition of the G2G pack. And like everyone else I love the doily dress. Thank you for tutorial and the links! Super duper awesome. that doily dress is just too cute. I love your doily art cards! This is a very clever idea and thanks for the tips on coloring. I'm a spray person myself, too. Love, love, love your cards. Sometime in the next few days, I'm going to get back to it. Really love all the cards you did as guest artist and the dress was a true fav of mine, thanks for sharing! Love the doily dress idea. I'll have to check out that Pinterest page you did. TFS! I mentioned before how cute that doily dress is - I can't wait to try it out. Great card idea with the doilies! Thanks for sharing! You are so smart. :) Love this! Cute cards! Love the dresses!